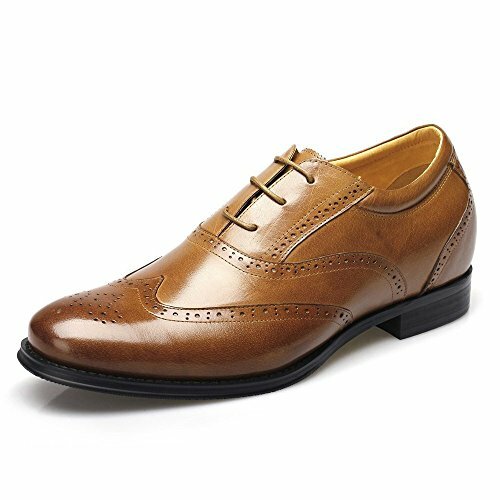 Wearing our Chamaripa elevator height increasing men lift shoes will help you walk straight, it will also help you stand with shoulders straight and head up. The heel lifts for shoes give support to the arch and they also add spring in steps to gain people's confidence, and shoe elevator high shoes for mens will make them more charming, The men shoes lifts elevator shoes always remind you the feeling of being higher! polyether whole pad increasing,accordance with the principle of arch mechanics, hardness of 55 °(within±5°), Health elevating. (light weight): whole shoes lightweight design, shoes weight accurate to gram. (natural rubber): We only choose premium natural rubber for outsole, flexible and high wear-resistant, without pungent odor of inferior rubber. (Design):A small round head design with bullock carved design, suitable for elegant man who requires comfort.